It implements most common low-bandwidth Application Layer DoS attacks, such as slowloris, Slow HTTP POST, Slow Read attack (based on TCP persist timer exploit) by draining concurrent connections pool, as well as Apache Range Header attack by causing very significant memory and CPU usage on the server. Slowloris and Slow HTTP POST DoS attacks rely on the fact that the HTTP protocol, by design, requires requests to be completely received by the server before they are processed. If an HTTP request is not complete, or if the transfer rate is very low, the server keeps its resources busy waiting for the rest of the data. 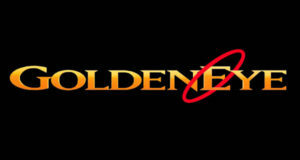 If the server keeps too many resources busy, this creates a denial of service. This tool is sending partial HTTP requests, trying to get denial of service from target HTTP server. Slow Read DoS attack aims the same resources as slowloris and slow POST, but instead of prolonging the request, it sends legitimate HTTP request and reads the response slowly. Need to get 29.6 kB of archives. After this operation, 98.3 kB of additional disk space will be used. Selecting previously unselected package slowhttptest. Where PREFIX must be replaced with the absolute path where slowhttptest tool should be installed. You need libssl-dev to be installed to successfully compile the tool. Most systems would have it. 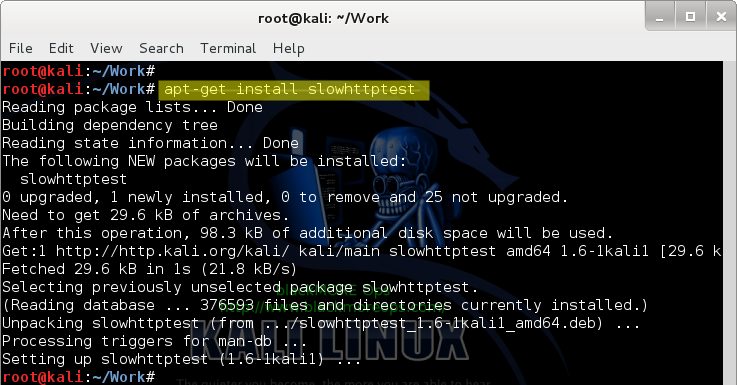 Try your favorite package manager, some of them are aware of slowhttptest (Like Kali Linux). Depends on verbosity level, output can be either as simple as heartbeat message generated every 5 seconds showing status of connections with verbosity level 1, or full traffic dump with verbosity level 4. -g option would generate both CSV file and interactive HTML based on Google Chart Tools. that contains graphically represented connections states and server availability intervals, and gives the picture on how particular server behaves under specific load within given time frame. CSV file can be used as data source for your favorite chart building tool, like MS Excel, iWork Numbers, or Google Docs. I’ve done this test in a sample server and this is what I’ve seen from both attacking and victim end. Thanks for sharing. I’ve never heard of slowhttptest before. 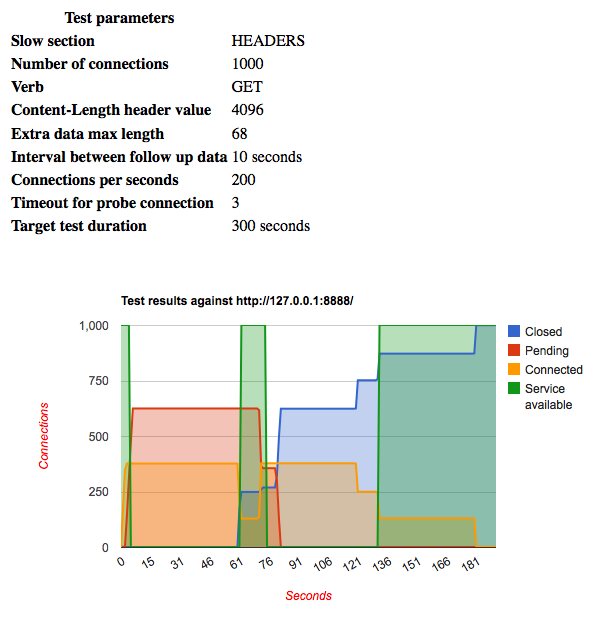 I was using apache benchmark tool (ab) for performance testing. Pleasure. It was a random find in Googlecode and I liked the project for it’s potential. You can attack or use it as a benchmarking tool. (The way I see, they are both the same – just different user-intent).